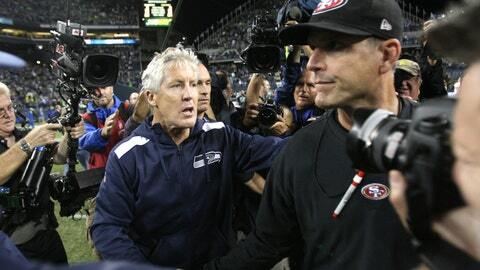 There's no love lost between Seahawks coach Pete Carroll (left) and 49ers head man Jim Harbaugh. On the ever-expanding list of why San Francisco and Seattle are mortal enemies, Jim Harbaugh didn’t react when Richard Sherman patted him on the rear end the last time they met. "It’s definitely a statement game," Vernon Davis said. The game will either say San Francisco is ready for a playoff run or the Seahawks have effectively replaced Jed York as owner of the 49ers, if not the entire NFL. Seattle is 11-1 and coming off a 34-7 wipeout of New Orleans on Monday Night. Rap star Drake dropped by practice this week to pat a few butts. Things are going so well the Seahawks could clinch the NFC West on Sunday and then prop up their feet for three weeks. In other words, or statements, Seattle would really like to win. The 49ers really need to win. They have a one-game lead on the Eagles for the last wild-card spot. More importantly, the 49ers might develop a serious inferiority complex if they don’t beat a decent team soon. Especially the one from Puget Sound. Seattle has won the past two games by a combined 71-16. Those are the biggest losses in Harbaugh’s NFL coaching career. The big rival clinching the division on your home field would be another major indignity and rev the skepticism over the 49ers. They are 8-4 and have won seven games by double digits. But if the BCS strength of schedule mattered, San Francisco would be heading to the Beef ‘O’ Brady’s Bowl. The 49ers’ wins are over teams with a combined 30-53-1 record. Arizona has the only winning record. That’s not to say the 49ers aren’t good. It’s just that they need to show that against somebody better than Carson Palmer. Say hello to Russell Wilson. "He’s a fantastic player," Harbaugh said. "Wonderful, wonderful player." Harbaugh doesn’t usually blow that kind of smoke about opponents. And he sure hasn’t had many nice things to say about Seahawks. The spats with Pete Carroll are well documented, dating back to their Pac-10 days when Stanford ran it up on Carroll’s USC team. "What’s your deal?" Carroll asked when they met at midfield. Fortunately for NFL fans who like a good feud, the animosity has carried over and spread through their organizations. "They don’t like us," Davis said, "and we don’t like them." Sherman played for Harbaugh at Stanford and says his old coach was a bully. He had one of the three interceptions of Colin Kaepernick in Week 2 and couldn’t wait to see Harbaugh afterward. It was so fast Harbaugh didn’t know what hit him. "I didn’t realize it was him until he was moving in the other direction," Harbaugh said. Sherman took it as a deliberate snub, of course. "I told him, ‘Good job. Good game,’ but he didn’t give me nothing back," Sherman said. "I guess sportsmanship doesn’t go both ways." This rivalry demands that kind of reaction. Everything is a potential affront. "It seems he tries to be a professional in front of the camera, but he does his antics like that when the cameras aren’t around," Earl Thomas told the NFL Network. "He’s just a big kid." Harbaugh denied it happened, though it would be interesting to be in the parking lot Sunday night if the 49ers can beat the NFL’s hottest team. Would he toot his own horn? That’s the kind of statement San Francisco needs to make.